If you’ve ever found yourself arguing about whether eating meat is healthy for you and the planet and, if so, which meat to eat, you now have some answers. The Environmental Working Group (EWG), which brought us the “Dirty Dozen,” a list of the 12 most pesticide-ridden fruits and vegetables, released a report yesterday showcasing the carbon footprint of 20 conventionally grown popular protein sources, from lentils to lamb. To come up with the carbon impact, the EWG looked at the food’s full “lifecycle”—including the water and fertilizer to grow feed crops, transportation of the food and even the amount of food that’s wasted. 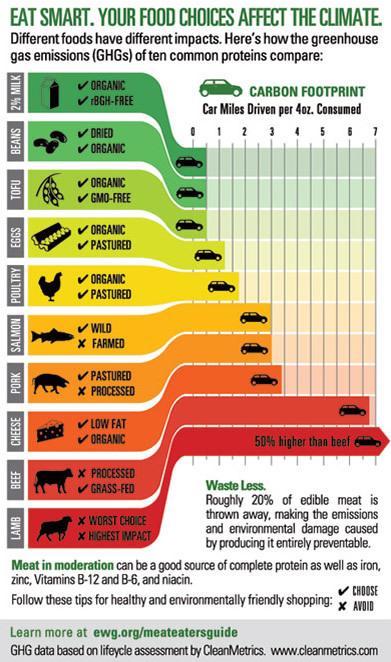 The biggest take-away: eat less meat and avoid wasting it (20% of edible meat ends up being tossed). Why should you care? The implications of this report are twofold—environmental and personal health. On the environmental side, the United Nations recently determined that livestock is one of the top contributors to the world’s most serious environmental problems. Going meatless can reduce water pollution, waste and greenhouse gases, and save energy, land and water. As for personal health, science shows that eliminating or cutting back on meat may improve blood pressure, decrease your risk of heart disease, lower cholesterol and help better manage your weight. The EWG’s full list of 20 “meats and other protein” sources includes vegetables like broccoli and tomatoes that, while having a low carbon footprint also deliver very little protein (around 1 to 2 grams per serving). So to bring you the 5 best and 5 worst proteins, I’m sticking to the EWG’s abbreviated pocket-guide version and annotating with my own comments as a registered dietitian and associate nutrition editor at EatingWell Magazine. To find out what ranked best, worst and in between on the full list of 20 protein choices, click here. 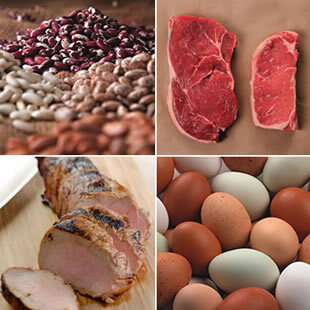 What's your top consideration when buying meat and other protein sources? Kerri-Ann, a registered dietitian, is the associate editor of nutrition for EatingWell magazine, where she puts her master's degree in nutrition from Columbia University to work writing and editing news about nutrition, health and food trends. In her free time, Kerri-Ann likes to practice yoga, hike, cook and bake.